4 August 2017. 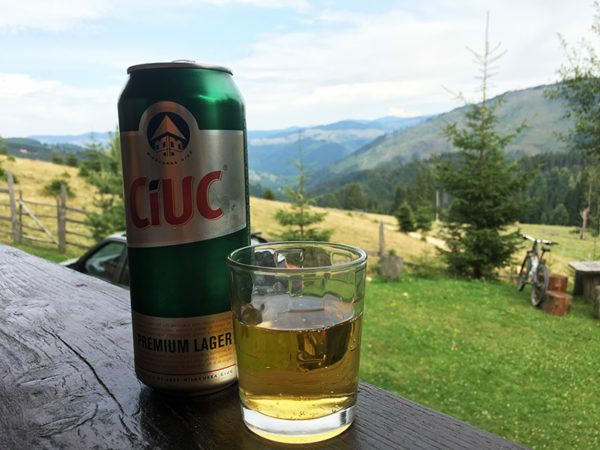 It’s my third trip to the cabana in the Șureanu Mountains, part of the Southern Carpathian. This is the first time we would cycle all the way from Serbes to the cabana. The biggest accomplishment is how I temporarily overcame my fear of descents on bike to get to the destination. In 2013, we ran from Tau-Bistra, the village at the base to the cabana. My in-laws had dropped off at the village. 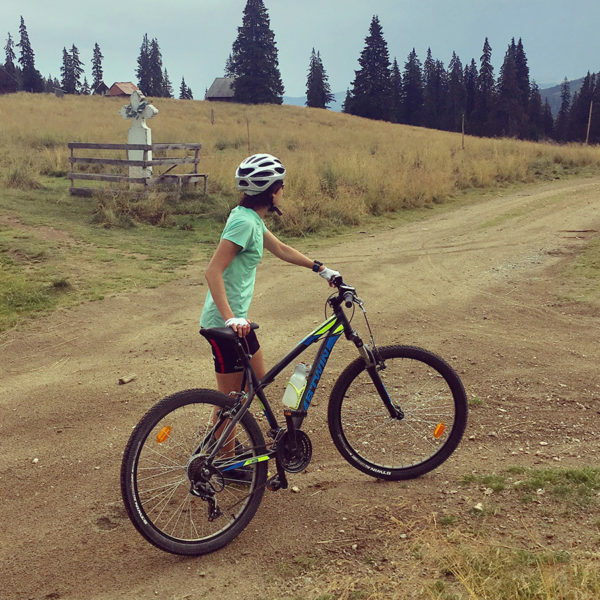 In 2016, we hurriedly bought two “unbrand” mountain bikes from some local shops to jumpstart cycling in Sebes. 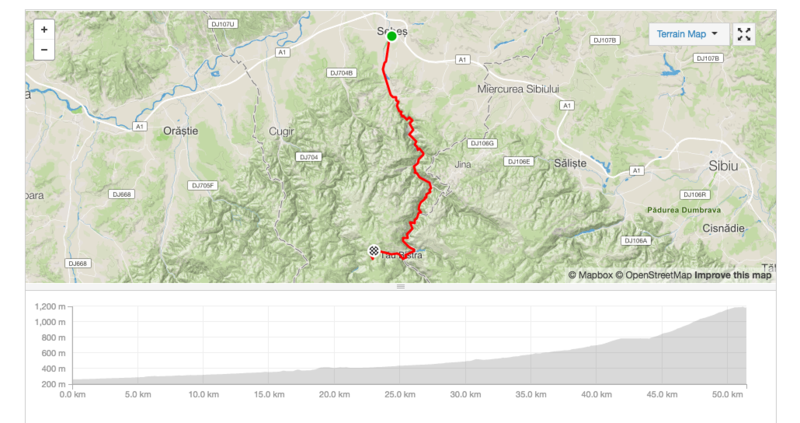 With my kid-size bike, I managed to do my first long ride of 45km on TransAlpina road (DN67C) from Sebes to Tau-Bistra. It was not a fun ride as I was suffering from a lower backache due to the wrong bike fitting. This year, we bought new mountain bikes (third bike, second mountain bike in 12 months!) from Decathlon. With my new BTWIN 340, I completed the round trip to the cabana, 51km each way, 994m elevation gain. The first 45km was on asphalt, and was easier than last year’s ride because of the new bigger bike. The last 7km to the cabana came with a gradient averaging 6.5% on dirt road. It was my first time cycling on this type of terrain. Rocks of different sizes littered the way, with sections of steepness as high as close to 10%. The weather was not helpful either; we were totally exposed to the merciless sun, glaring down at us at 30s°C. I have to confess that I had to push my bike two times – each time was less than 50m. I remembered each time vividly: I lifted my head and saw an electric pillar standing slightly elevated, less than 50m away. Honestly, it was only a few metres uphill, but my exhaustion just gave way. Or that the lazy-me defeated the determined-me. The electric pillar seemed impossible to reach, and I just pushed and walked my bike. The day ended with a tasty barbecue, accompanied with a refreshing local beer. Despite the two moments of weaknesses, I was very satisfied with my accomplishment. My satisfaction turned to wonder (smiley face :-)) when we made the return trip on bike three days later. It was the revisit of the route, in reverse, the never-ending 30min downhill ride on the rocky path, that made me realise how long the route really is. I was proud of myself for not giving up and jumped into the car of my in-laws, who waited patiently at different points along the route to rescue me! To prepare for my MTB downhill ride on the return trip, we practised descent two days after. The training started with a continuous descent of 5km on uneven terrain. My fingers got so numb on holding on the brakes (albeit lightly) and I was super tensed throughout most of the ride. Despite my overworked imagination, I suffered no accidents. Photo taken at the 5km pitstop. Have I mentioned that I don’t like bike descents? It may be accurate to state that I prefer ascents to descents. Ascending skill depends principally on one’s physical and mental fitness. I have an average physical fitness, but my mental fitness is definitely above average. As such, I am more adept at absorbing pain, refusing to give up my objectives (proven by the ultra-distance trail races I used to do) despite my crazily pounding heartbeats, bursting lungs, and pleads from my blatantly exploited quadriceps. On descents, motor skills, experience and fear-deficit play bigger roles. 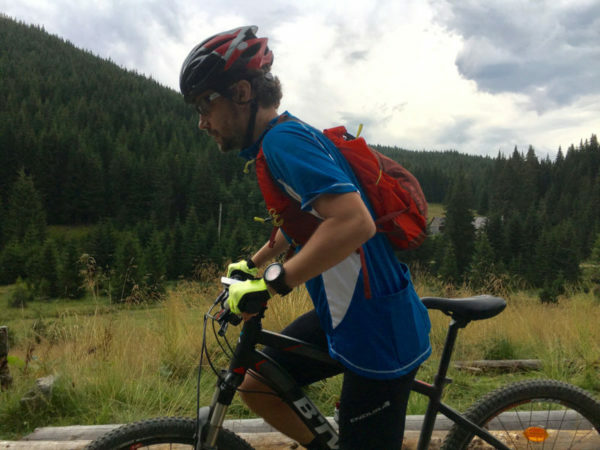 Being a newbie in cycling, and in this case, mountain biking, it would of course take time to accumulate experience and fine tune my motor skills (e.g. navigating corners, sailing over bumps). Unfortunately, for me, I think fear-deficit is something I can never possess. I have always been unreasonably afraid of speed. Unease would set in even while travelling in sturdily-built cars driven by experienced drivers over 100km/h. You can thus imagine, how could a transportation that is made of a few metal rods and two rubber wheels, moving with the aid of gravity, assuage my fear of speed? Two days after. At Porata Raiului “Heaven Gate”. Should I stop or should I continue? My usual placid imagination would switch to the highest gear. Horrid, vivid images of me being flung out of my bike cross my mind. The most common image I have is of my bike tripping over a rock, and I rocketing out of my saddle, flipping over the handlebars, landing face-up in front of the bike, with a thud sound! The horror compounds with a vehicle driving up at that exact moment, and running over me – sparing me no chances of survival. The worst thing is that this scenario is highly possible, since my brakes are usually on for steep descents (steep is of course, relative) and thus reduces the momentum for the bike to ride successfully over bumps. Another frequent image of me is my unsuccessful attempt in cornering my bike, resulting me in crashing a guardrail and getting flung over it, and worse, rolling down a steep slope covered with jagged rocks, and finally into a river. Two days after. 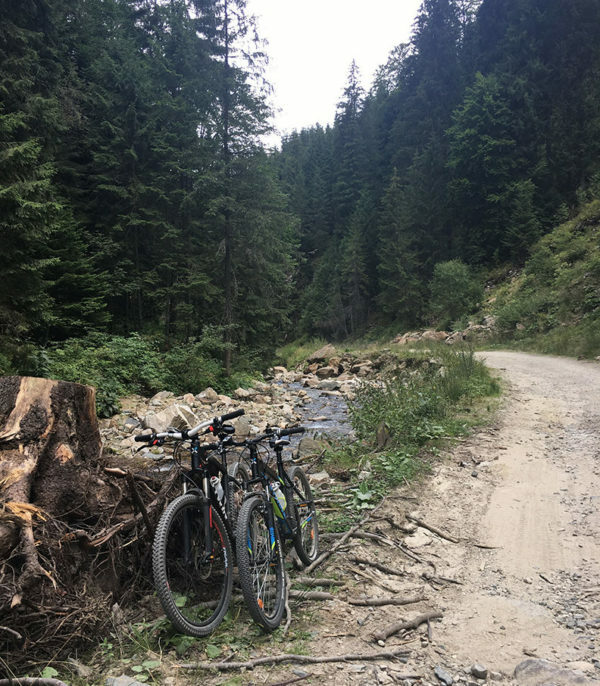 I decided to cut short a ride (my first MTB descent training; having done 8km/13km down/up) after being informed that I would still have to travel 30km+ of downhill before making an ascent from the base up to the cabana. The stress of downhill coupled with the looming dark clouds helped me to make up my mind, but did not put me in the best of mood. I hate giving up! Picture of Silviu ready to set off after helping me to put the bike in the car. The cycling weekend ended with me safe in one piece (other than some bruises on my legs due to frequent banging of my legs against the bike during the bumping rides). Next weekend will be another cycling one, triple the distance and elevation gain…that is, if I decide and am able to catch up with the crazy guys. Until my next post!